Over the past several years developments in the design and construction of vaporizers has opened up a whole new world of dry herb vaping experiences. From increased highs, to enhanced flavours, dry herb vaping has evolved and matured into an easy, controllable and satisfying experience. Here are Happyrasta’s Top 10 reasons why everyone should try dry herb vaping. I’m not a Doctor, but we all know smoking isn’t good for your health. Some people may argue that vaping may also be bad for your health, but there are some notable differences to point out. Vaporizing does not combust your herbs, instead it heats the herbs until the oils within steam out, creating a vapor. With Vaping you inhale some of the oils and very little of the herb’s vegetable matter. With Vaping, what is left behind still has considerable mass. Compared to smoking, where only weightless ash is left behind – and even some of that is consumed into the lungs. With less stuff inhaled, and less nasty chemicals – vaping is the far better alternative in my book. Plus you can feel the difference when transitioning from smoking to vaping – it is smother and less irritating to the chest. So if you are care about your health, you should definitely consider a transition to vaprozing. Lets face it, second hand smoke is not always appreciated by those around you – especially to non-smokers. Vaporized herbs vs combusted herbs are a very different smell. Vaporized herbs can still be quite noticeable, but vaporized aromas don’t hang around as long as smoke, and they tend to be less obnoxious to others. Vaporized herbs smell quite pleasant compared to smoke. Smoke on the other hand is very strong and noticeable. Our instincts are conditioned to be alarmed by smoke, its hard to ignore. Everyone knows the smell of smoked herb, but when herbs are vaporized it tends to go unnoticed – its not as well known a smell. So if you want to consume herb around other people, or indoors, vaporizing is a much better alternative. It provides and nicer aroma, which is less strong and doesn’t stick around as long compared to smoke. For those who want to go a step further, SmokeBuddy personal filters are a good way to eliminate vaporized odours. Simply exhale though your Smokebuddy when vaping and no smell or vapor comes out the other side of it – they work perfectly! Compared to smoking, vaporized herbs smell less strongly and provide an aroma that is less commonly recognised. Quite often, you can take small puffs on your vaporizer without anyone even noticing. Unlike smoke, the smell does not linger or permeate your clothing. Compared to smoking implements like pipes and joints – many dry herb vaporizes look like just another tobacco vaporizers, the sort that are used everywhere. There are several good vaporizers that are very compact and easy to use disctreetly. Vaporizers like the PAX are extreemly compact and can be concealled in your pocket or hand with ease. It’s hard to travel with a bong, and pipes can be pretty rough. Before portable vaporizers came onto the market it was fairly inconvenient to consume your herbs when out and about. However, vaporizers excel at things like convenience and discreetness in a way that makes them perfectly suitable for travelling. I would never have left the house with my herb and pipe in the same casual way that I am able to with a dry herb vaporizer – packed, ready to use, light, reliable…. Portable vaporizer can be pre-loaded with herb or concentrates and used wherever you are comfortable by a simple button press. In bad weather these devices still work perfectly. As long as you are prepared to ensure your batteries always have charge then there really is not better solution when travelling than a portable dry herb vaporizer. Vaporizing your herb allows the entire smell profile of the plant to come shining through and you discover a rich array of flavours. Compared to combustion, which eliminates many lesser terpenes altering the taste, and add smoke to the flavour mix. After vaporizing for a few days there is no turning back in terms of flavour. There is so much more flavour when vaping, that smoking in comparison becomes just the taste of ash. Additionally, combustion creates hot dry hits of lung-irritating smoke. Vaping feels more like breathing in warm, humid air. There is no comparison – vaping is much more pleasnt experience. This may not be true of all vaporizers, but the efficient ones are way better than smoking when it comes to getting the most mileage out of your herb. Good Vaporizers manage to get every ounce of oil out of you herbs and it shows when the same amount of herb that you used to use for yourself is now enough for 3 or 4 people. While many vaporizers need to be filled completely with herb to work their best, there are others like the Arizer Solo pictured that also work perfectly when only partially packed. This allows for super efficient – combining the ability to used small amounts of herb with high efficient to get the most mileage from your herb. That is right, dry herb vaporizers are 100% legal. Dry Herb Vaporizers are not considered in the same category as smoking implements like pipes, bong and hookahs – all of which have restrictions in some states and territories. Dry Herb Vaporizers come under the same regulations as tobacco vaporizers. In all states it is legal to buy, sell and own Vaporizer (except WA where vaporizers are legal to buy and own, but not to sell). Additionally Dry herb Vaporizers are marketed, imported and distributed as aromatherapy devices. 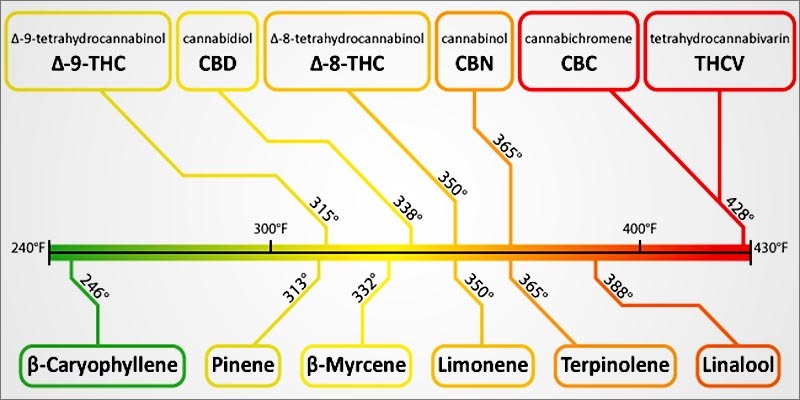 Most manufacturers go to the lengths of including things like information charts of what temperatures to vaporizes different herbs in their packaging. Depending on how you use your dry herb vaporizer, especially when using with liquids and concentrates, there are more opportunties to regulate your herbal dosage with vaporizers. Vaping can provide a more reliable and repeatable herbal experience. Vaporizes have additional appeal to those looking for medical use, since vaporizing provides and alternative to smoking, which can be excessively rough for those who are not used to it. Vaporizers let you control the temperature you are vaping at. This allows you to alter the flavour and concentration of the vapor. A lower temperatures will provide a more delicate and more natural flavour, along with a cooler and less dense vapor. Higher temperature will provide a thicker vape cloud, and a more caramelised flavour. Some people like to get the best of both worlds by starting at a lower temperature and increasing it through the session. Limiting your vaporizers upper temperature can also change which chemical compounds get released into the vapor stream, or their ratios, and make the difference between felling energised or needing a couch nap. Vaporizers give us more control over what goes in out bodies and what get left behind. #10 Dry herb Vaporizers are Awesome! There have been some good dry herb vaporizers on the market for several years now. Particularly when considering one of the best and most well known vaporizers, the Volcano by Storz & Bickel, was released almost two decades ago now. Portable vaporizers however have advanced notably in the last few years, maturing to become more reliable devices with better batteries, flavour, and vapor production. Now we are seeing much sleeker devices, with more detailed manufacturing, components and designs. Brands like the PAX, DaVinci and Firefly have continued to reinvent their product and, over successive generations, are refining to provide beautifully crafted high quality devices. There are now many really good vaporizers available, and wide variety of solutions that make vaping convenient. If you would like to know more about what vaporizer would suit your needs, feel free to contact us on info@happyrasta.com.au to discuss the features and options available.